Welcome back to Part II of Benjamin Waldman’s walk around the island of Manhattan. Yesterday we explored the Waterfront Greenway along the Hudson River. Today, the Greenway moves inland until it meets the East River. Don’t forget to also check out Phillip Lopate’s wonderful book, Waterfront: A Walk Around Manhattan. Just north of the Cloisters, the Greenway leaves the waterfront via stairs (top left photo) and proceeds under a bridge (top right photo). The path follows Riverside Drive to Broadway where it switches to Dyckman Street. This stretch of the Greenway, if it can be called that, is a good place to stock up on supplies before heading back to the river. The waterfront is almost in reach after passing under the elevated subway tracks. The Sherman Creek Park section is one of the nicest, and least well known, sections of the Greenway. It is well maintained and landscaped and contains Swindler’s Cove Park and the Peter J Sharp Boathouse. Continuing next to the Harlem River Drive, the former Harlem Speedway, an asphalt path is separated from a dirt path by a strip of trees that will provide a welcome stretch of shade when they mature. The paths join together, into one older one that is in need of repair, to pass under three East River bridges. The first is the 1888 Washington Bridge, followed by the 1960 Alexander Hamilton Bridge, and lastly the 1848 High Bridge. The High Bridge, which is the oldest remaining bridge in New York City, was constructed along with the High Bridge Water Tower (bottom right photograph) as part of the Croton Aqueduct System. In 1928, the central arches of the bridge were sadly demolished and replaced with a modern steel arch in order to improve navigation on the Harlem River. 3. 163rd Street to 155th Street. 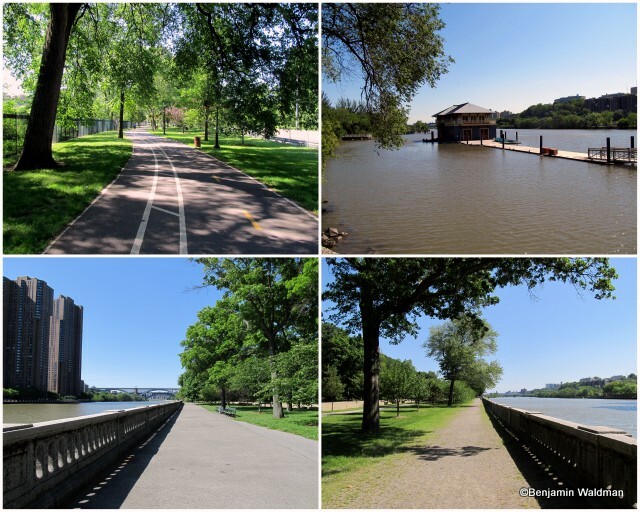 Around 163rd Street, the Greenway departs the Harlem River for a section that is desolate, lacking in any signs and in need of some form of rehabilitation or sprucing up. At 155th Street, the City has installed a helpful Greenway map and metal signs indicating the Greenway’s path. These signs are helpful for the segments of the Greenway that exist in their temporary state on streets. Unfortunately, they only appear intermittently. After passing the Hooper Fountain, which is one of the City’s remaining horse fountains, the Greenway heads down St. Nicolas Avenue. On St. Nicholas Avenue, the Greenway passes the 1888 James Bailey House (Bailey partnered with P. T. Barnum to form Barnum and Bailey’s Circus), City College of New York’s Gothic campus, and Hamilton Grange, which was Alexander Hamilton’s house. At 120th Street (or 119th depending if you are walking or biking) the Greenway heads back towards the waterfront. At 120th Street and Lenox Avenue the Greenway passes Mount Olivet Baptist Church (former Temple Israel of Harlem) designed by Arnold Brunner. Although it is now a church, many of the synagogue’s interior features remain. After passing Marcus Garvey Park, which has the City’s only remaining fire watch tower, and walking under the elevated train tracks at Park Avenue, the waterfront reemerges. A pedestrian bridge takes the Greenway over the FDR Drive and back to the water. This segment of the waterfront would benefit from more trees and better maintenance, but overall it serves its basic purpose. The condition of the Greenway here likely stems from its location and the lack of visitors compared with other portions of the Greenway. The former Benjamin Franklin High School, Pier 107 CVII, a restored 1931 pier, the 1951 Wards Island Pedestrian Bridge, the 1936 Triborough Bridge (or Robert F. Kennedy Bridge), and the majestic New York Connecting Railroad Bridge (or Hell Gate Bridge) provide a varied backdrop to this segment. Around 90th Street, the Greenway is once again beautifully landscaped and welcoming. There is one combined stone paver path for pedestrians and cyclists. The 1941 Municipal Asphalt Plant was where New York City made asphalt and when constructed, was the only building like it in the country (it is now home to Asphalt Green, a sports and fitness center). At 90th Street, the Greenway inclines into Carl Shurz Park where Gracie Mansion is visible through the foliage. The Carl Shurz Park segment of the Greenway is a wide cantilevered structure that predates the current Waterfront Greenway. It was renamed in memory of John Finley who was President of CCNY and Commissioner of Education of the State of New York. This section provides views of Roosevelt Island, including its 1872 lighthouse and rebuilt Octagon. This portion of the Greenway ends with a staircase taking the path back down to river level. Separated from the FDR Drive by a thin patch of grass and a concrete barrier, the above segment of the Greenway is pleasant, though its small width lends itself to traffic jams. The East Side House Settlement, which has been serving New Yorkers since 1891, the 1902 Pegram Powerhouse, and remnants of the area’s nautical past grace this section. Waterfront access currently ends at East 63rd Street. There, the Greenway takes a pedestrian bridge over the FDR Drive. The path then follows Sutton Place under the Queensboro Bridge (Ed Koch Bridge). After the Queensboro Bridge, the inland segment of the Greenway is not well marked. It’s important to either bring a map or write down the directions beforehand. The Greenway follows Sutton Place to East 54th or 53rd Street and from there to 1st or 2nd Avenue. Taking 1st Avenue, the Greenway passes the United Nations Headquarters and the Raoul Wallenberg Memorial. The Greenway follows East 37th Street and East 38th Street back to the waterfront. Walking under the above pictured underpass (through the metal gate) leads to a great view of the southern end of Roosevelt Island, the Queensboro Bridge, and Long Island City. The first segment of the Greenway along the waterfront is well manicured and beautifully designed. In contrast, the following sections of the Greenway are made up of a patchwork of different paths in varying states of construction and size. Traveling through a hospital parking lot, past the Marine and Aviation Building, and through another large asphalt space this section of the Greenway leads to Stuyvesant Cove Park. Stuyvesant Cove Park is well landscaped and possesses a small, though inaccessible, beach. A wide, well maintained, section of the Greenway leads to a very narrow, barbed wire bound, segment next to the ConEdison Plant at 14th Street. After squeezing through this section, you are rewarded by reaching the East River Park Section of the Greenway. You are afforded the choice of either taking a shaded inland path or the newly constructed, and almost complete, waterfront path. The waterfront path is one of the Greenway’s gems. It contains a well landscaped path with views of Brooklyn, which include the former Domino Sugar Factory. After walking under the 1903 Williamsburg Bridge, and taking a possible detour through Corlears Hook Park, the waterfront path merges with the inland path. Once again, there is no waterfront access. Instead, a patchwork of paths makes up the Greenway. After passing the Manhattan Bridge, waterfront access is once again possible, though it is also possible to stay in the shade provided by the elevated FDR Drive. After passing under the Brooklyn Bridge, and past the former Fulton Fish Market, the Greenway passes through South Street Seaport. If you are riding a bike it is advisable to take the path pictured above running under the FDR Drive. For those intrepid travelers who don’t mind braving the throngs of tourists, waterfront access is possible. The waterfront path transforms from a wide, well landscaped, section to a narrow concrete path sandwiched between the highway and the water. This segment of the Greenway, which is not marked, passes the Battery Maritime Building, from where the Governor’s Island ferries depart, and the Staten Island Ferry Terminal. At Battery Park, there are two possibly paths to take; one winds its way through the park, without any signs, while the other entails following the edge of the park until the Greenway becomes a distinct path again. The outer path passes: the Shrine of Saint Elizabeth Ann Seton, a shrine to the first native born citizen of the United States to be canonized by the Roman Catholic Church, the Bowling Green IRT Control House, one of the only remaining original subway entrance buildings, and the former Alexander Hamilton Customs House, now home to a branch of the branch of the National Museum of the American Indian. The former Standard Oil Building, the Brooklyn-Battery Tunnel Ventilator Building, where the Men in Black are headquartered, City Pier A, which is currently being restored, and Castle Clinton, one of the National Parks sites that abut the Greenway, complete the Battery Park segment of the Greenway. From here the Greenway continues alongside the Hudson River. As you’ve seen, walking Manhattan’s waterfront is not as simple as one might assume because Manhattan’s waterfronts are still not fully accessible but it’s still well worth exploring, with many gems along the way.